Casio has announced the availability of its new ultra-compact superzoom digital camera – Casio Exilim EX-H10, the 12.1 megapixel camera which the company claims as the world’s thinnest and lightest camera that incorporates battery life of 1,000 shots and ultra-wide angle 24mm lens with 10x optical zoom, aiming to enhance your photography experience. According to Casio, the Exilim H10 includes advanced Dynamic Photo function that able to create composite moving images thanks to its high-speed image processing technology. When a moving subject is cut out of a number of images and combined with a different still shot that forms the background, the size of the subject can be changed to suit the background image. Next, the Dynamic Photo video can easily be converted in-camera into Motion JPEG movie file. Moreover, moving graphics like hearts and bouquets of flowers are included so that users can have fun decorating their photos using the Dynamic Photo function. 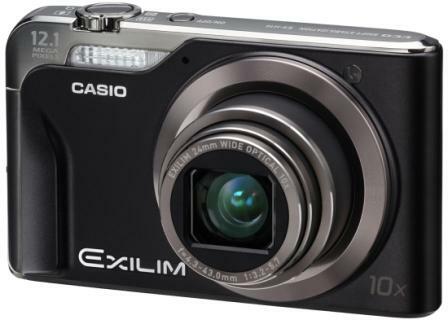 The new Casio Exilim EX-H10 which measures 102.5(W) x 62(H) x 24.3(D) mm and weights just 164g is expected to be available by mid-July 2009 for around $300.